Engaging with the right law firms is critical to the success of legal departments, yet many departments lack structure in selecting firms, assessing firm performance, and providing regular feedback. Having a structured process in place provides the data and confidence needed to support your initiatives. important to the success of the legal department. Effective programs incorporate measurement, goal setting, review, communication, and accountability into a routine process. Why not make it easy for corporate law departments to demonstrate their value to the organization? 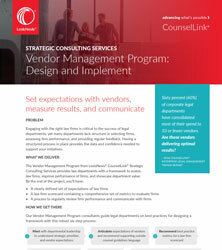 Establishing a disciplined process to select and assess vendors provides management tools to both improve value and to demonstrate it. More mature legal departments take a thoughtful, informed approach to day-to-day and strategic decisionmaking. The Strategic Consulting Group helps corporate legal departments advance in maturity through service offerings that deliver process improvement, robust use of data, metrics and analytics, and change management.